Through her Do It Scared® podcast and Living Well, Spending Less® blog, Ruth Soukup encourages more than one million subscribers to face their fears and reach their goals. Her blog post that got the most reaction was about how she took away her kids’ toys, and has never given them back—and they don’t want them back! She lives in Florida with her husband Chuck and daughters Maggie and Annie. 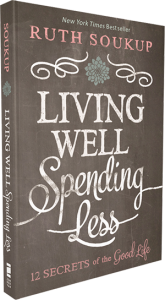 Through personal stories, Biblical truth, and practical action plans, Ruth will inspire and empower each of us to finally declutter not just our home, but our mind and soul as well. 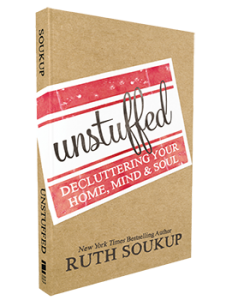 Unstuffed is real, honest, and gets right down to the question we are all facing--how can we take back our lives from the stuff that is weighing us down?